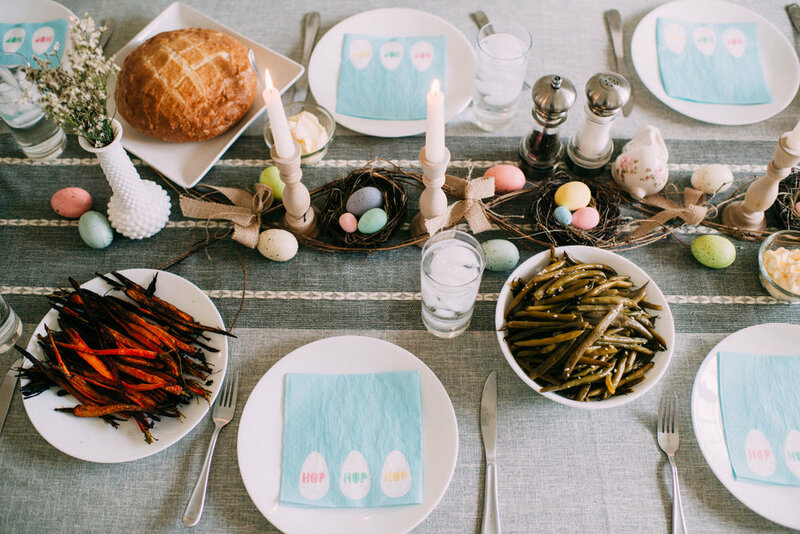 An Eggscellent Easter Spread for Your Sunday Meal! While we tend to have too much food no matter the holiday (no complaints there!) we like to keep things pretty simple. 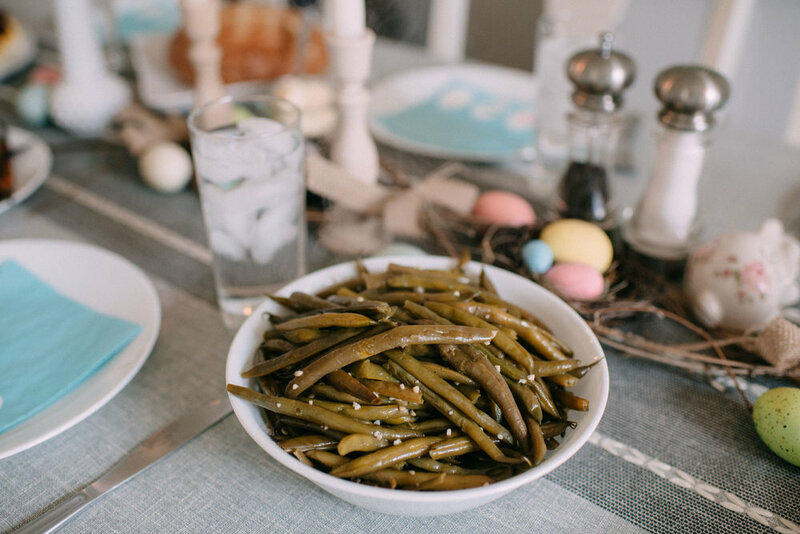 For our Friends Easter, we enjoyed a delicious ham, honey glazed carrots, green beans, baguettes, deviled eggs, and another favorite of mine…mashed potatoes! We also indulged in the desserts, and went with a yummy Kroger Carrot Cake, and cute Easter themed sugar cookies. YUM! If you’re looking for some Easter inspiration, I hope this helps! If you need to pick my husband’s brain for recipe ideas, or any further details, don’t hesitate to e-mail me. He really is an amazing cook and I am SO thankful for him!! Here are a couple of the items Asa (my husband) whipped up. You’ll have to tell me if you re-created any of these ideas or how this post inspired YOUR Easter planning! Happy Holiday, sweet friends! Everything found in this blog post was purchased at our local Kroger, but it was not sponsored by them. I just wanted to show you what we did for this meal and thought it may be helpful to know where we got everything, decorations included! Life with Six Indoor Pets, Yes...SIX! One of the things I love most about this mop is how quickly and efficiently it DOES pick up those floating hairs and loose pieces of dirt. It’s incredibly easy to use and it leaves our floors super shiny. Our dogs daily sleep in our bedroom. When they were younger and before our older guy Humphrey was prone to having accidents (sigh), they had free roam of the house. When we did it that way, it was nice because there wasn’t one designated dog space, which never left that distinct ‘odor.’ Not that our room reeks or is disgusting, but if you own dogs you know that if they’re shut in a room (especially if you have more than one), when you open the door you can SMELL their dog scent. Thankfully, Febreze Fabric for the win, which also if you’re a pet owner you probably (hopefully?!) already know of this product! We use this incredibly often—it’s 100% safe to use on our rugs, bedding, and even the dog bed that resides in our bedroom too! So, yes, we have SIX indoor pets. But our goal is that that wouldn’t be super noticeable when you walk in our front door. We aim to keep our floors and furniture hair and dust free, and that there wouldn’t be any pesky pet odors. Swiffer offers easy-to-use sweeping, mopping, and dusting cleaning tools for virtually every household surface. They’re quick and help you not sweat your pet so your family can spend less time worrying about the mess and more time playing with your pet. And Febreze makes it so that our home is always fresh smelling, no matter where our pets sleep :) Where can you get these products? We always get them at our nearby Kroger, where we get the vast majority of our cleaning/household/grocery related needs! I am curious what you use in your house when it comes to cleaning products? Leave a message in the comment below and fill us in, maybe there’s something I should add to our must haves! “Dear one, may I say something? It is not shallow or empty or frivolous to create a beautiful space to live in. It is not silly, not vainglorious, not a waste of time and energy. It doesn’t make you superficial nor slides you down the godly scale. We spend the majority of our hours in our homes with our people. Creating beauty and nurture under your roof with colors that soothe, art that inspires, furniture that invites, and textures that thrill is a wonderful use of your small space on the planet” (67). I take a lot of pride in striving to keep our house clean. Some days we may find more clutter or pet hair than others (we do after all now have SIX pets living inside our humble abode…) However, there are some pretty basic steps that we do that guarantees pretty well for our house to be clean and put together. If you’re anything like me, you want something that you feel good about for your family, but you need something that works and won’t let you down. Do you agree? I am ALL about products that take care of our essential needs, while doing the job they are designed to do…even and especially when it comes to dirty dishes. After every single meal, my family and I make sure that dishes are loaded INTO the dishwasher, and that they don’t simply pile up. Truthfully, my husband and I don’t even sit down for the night until this step has been made because doing so takes off stress and pressure in our busy mornings. With 1/3 bio based and other thoughtfully selected ingredients, New Cascade Pure Essentials is free of phosphates and chlorine but also FULL of power needed to get our dishes and silverware sparkling clean. I grew up in a household with a mom who always ran the dishwasher, regardless of how full it was. Every morning one of my chores was to empty the dishwasher and still to this day, it’s actually a task I kind of enjoy doing. Using a product such as Cascade makes this ‘chore’ even easier for us in the long run, because it cleans even baked-on foods and is tough on stuck-on messes. An added bonus, perfumes in the formula are infused with essential oils that offer a light citrus aroma (Lemon Essence and Orange Blossom). I really can’t stress enough how much we love using Cascade Pure Essentials. These are available at Target stores nationwide. Through March 30, save $1 off Cascade Pure Essentials (30 count or larger) using Cartwheel in the Target App here. “I know that Goldens shed…but do they shed a LOT?” I’m asked that question ALL the time, and my answer is always this: “Sure they shed a lot, but they’re more than worth it.” If I didn't have a trusty and reliable vacuum though, I may be swayed on that belief—however, we use a great cordless vacuum, and daily (or a couple times a day) we are able to pretty effortlessly clean our first floor with it. Yes, animals shed and kids track in dirt, but if you can get used to doing this in your daily grind, I really believe your stress will be lighter. What is your LEAST favorite adulting job…? Without a doubt, mine is laundry. Gone are the days of living at home, where your laundry was magically out of your hamper one day, then folded and ready to be put away the next. (Unless you’re MY kids…because that’s the story of their current life, ha ha). My husband and I try to do ONE load of laundry a day. And not just throwing it in the washer to let it sit and get covered with mildew…no, actually complete the laundry process: wash, dry, fold, put away. When the weekends come, we can breathe easier and we aren’t struggling with a multitude of laundry to contend with. This chore doesn’t come so effortlessly for me (or either of us), but when we follow through and make it happen, our life feels a LOT lighter. Habit #4: Put It Away! Every single night, our kids know they are supposed to pick up EVERYTHING off of their floors and put said things away in their proper places. And me, Mom, does this too in my own bedroom. Dirty socks, shirts, a random shoe, or whatever object that isn’t in its’ proper home—I put it away. This is another area in life that we don’t easily rest UNTIL the job is done? So we make sure to do it. A helpful idea is to set a timer for 20 minutes, and go crazy getting rid of/picking up clutter. I don’t know if you have kids or how old they are, but they need responsibilities. Ours are 5 and 6 years old, which is plenty old enough to carry up toys from the steps, and to make sure dirty or clean clothes are in their proper storage areas. Instead of trying to tackle our entire house (we have a two story house with an unfinished basement and with three bathrooms..) it makes more sense to clean one room in entirety, a day. I mean beyond the daily vacuuming and de-cluttering. Whichever room is scheduled for that day, clean it and clean it WELL. If it’s the bathroom, remove wastebaskets, scrub out the shower or bathtub, clean the sinks, wipe the mirror, and wash the floor with a cleaning solution. We have found that cleaning one room a day helps our weekends to be more restful, and often times, the kids ENJOY helping. Our daughter Reese LOVES to scrub toilets and to clean our basement steps. So vccc random and kind of funny, but she does a good job and at just five years old, she is learning what it means to create and KEEP a beautiful home. I know this sounds like a lot. But honestly with the help of my husband and kids this is 30 minutes a day worth of habits that really have changed the way we keep a clean house! What are some must haves in your household for creating a clean space? What daily habits to you already use? What would you add to this list? I would love to hear your thoughts, please comment below and fill me in on all your hacks! :) Happy Cleaning, Friends!